Inspired by the comic-book production pipeline, a method is proposed for integrating visual aspects of the sketching process into 3D sketch-based modeling systems. In particular, artist-drawn construction aids called visual scaffolding are explored. Two scaffolding components which simulate elements of pencil sketching, geometric massing and eraser marks, are integrated into a rendering pipeline which also includes a suite of new object-space techniques for high-fidelity pen-and-ink depiction of implicit surfaces. Based on a hybrid, hierarchical approach which leverages both the implicit surface definition and an underlying coarse tessellation, new methods are described for computing silhouettes, suggestive contours, surface stippling, and surfel-based visibility culling. 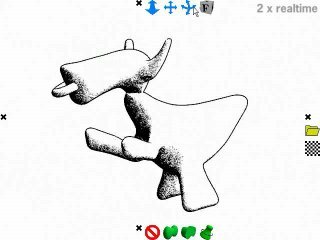 These techniques are real-time but require no pre-computation, allowing them to be applied to dynamic hierarchical implicit surfaces, and are demonstrated in ShapeShop, an interactive sketch-based modeling tool. The result is a real-time display pipeline which composites these novel scaffolding and pen-and-ink techniques to depict a visual history of the modeling process. 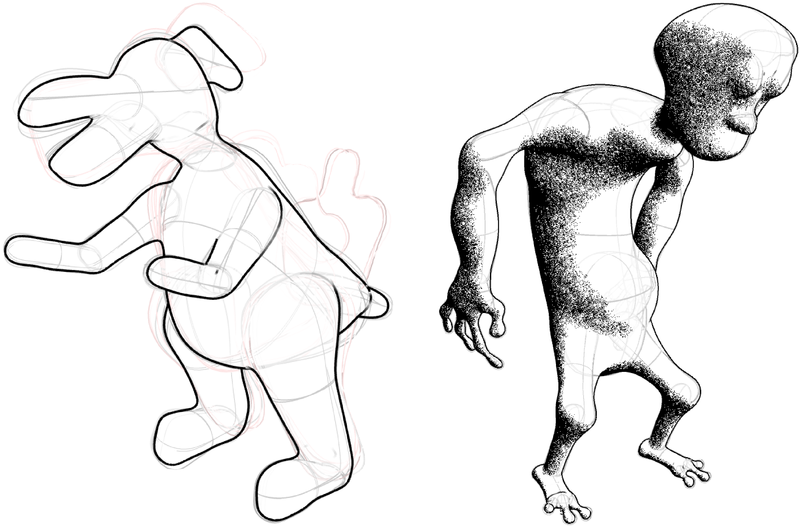 You can download a demo of Ryan Schmidt's ShapeShop (for more information see the ShapeShop Website at http://www.shapeshop3d.com/) which includes the pen-and-ink rendering of implicit surfaces with the the scaffolding and inking. This work was done at the University of Toronto, Canada, and the University of Calgary, Canada.